One of the most interesting aspects of Sigler's stories is that the majority of them take place in the Siglerverse, meaning that all of the stories share the same continuity timeline. And one of the more rewarding aspects of the stories is when characters or events from one story are recognized as having a relationship to characters or events in another story. 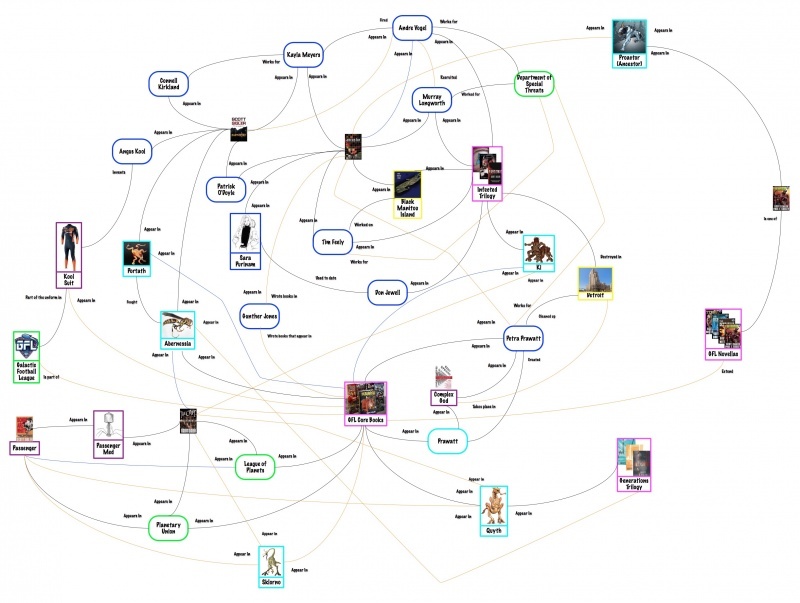 There are grouped stories in which the characters and story are necessarily interconnected. Perry Dawsey, for instance, appears in the infected Trilogy, appearing as a character first in Infected, then again as a character in Contagious, and then in flashback in Pandemic. This kind of interconnected relationship is not what this article is about. This article is about how the aliens glimpsed through the intergalactic portal in Infected are the Ki, who also feature prominently in the Galactic Football League books. There are many, many instances of this crossover relationship. For a graphical representation of these relationships, please click on the image to see a comprehensive guide. Note: The color of the connection is irrelevant. For the most part they are black, but a few different colors are used when a connection has to cross over the line of another connection. References to connections are to the Hardcover edition of a published title, if available. Connections appearing in multiple places have their first introduction identified in the references. ↑ Infected. Crown, 2008, p. 7. ↑ 4.0 4.1 Earthcore. Dragon Moon Press, 2005, p. 36. ↑ Pandemic. Crown, 2014, p. 55. ↑ Earthcore. Dragon Moon Press, 2005, p. 31. ↑ Earthcore. Dragon Moon Press, 2005, p. 28. ↑ Pandemic. Crown, 2014, p. 71. ↑ Ancestor. Crown, 2010, p. 131. ↑ Earthcore. Dragon Moon Press, 2005, p. 49. ↑ 13.0 13.1 Earthcore. Dragon Moon Press, 2005, p. 122. ↑ Contagious. Crown, 2008, p. 73. ↑ Ancestor. Crown, 2010, p. 212. ↑ Ancestor. Crown, 2010, p. 16. ↑ Ancestor. Crown, 2010, p. 65. ↑ The Starter. Dark Øverlord Media, 2010, p. 219. ↑ Ancestor. Crown, 2010, p. 154. ↑ Earthcore. Dragon Moon Press, 2005, p. 54. ↑ 21.0 21.1 21.2 Complex God (Robot Uprisings). Vintage, 2014, p. 4. ↑ 22.0 22.1 The MVP. Dark Øverlord Media, 2012, p. 86. ↑ Contagious. Crown, 2008, p. 433. ↑ Pandemic. Crown, 2014, p.35. ↑ Ancestor. Crown, 2010, p.114. ↑ Infected. Crown, 2008, p. 336. ↑ The Rookie. Dark Øverlord Media, 2009, p. 76. ↑ 28.0 28.1 28.2 The Tank (The Crypt). ↑ Earthcore. Dragon Moon Press, 2005, p. 153. ↑ 30.0 30.1 The Champion. Empty Set Entertainment, 2014, p. TBD (Ch. 16). ↑ 31.0 31.1 Earthcore. Dragon Moon Press, 2005, p. 256. ↑ The Rookie. Dark Øverlord Media, 2009, p. 134. ↑ Ancestor. Crown, 2010, p. 306. ↑ The Rider. Empty Set Entertainment, 2016, p. 155. ↑ The Rookie. Dark Øverlord Media, 2009, p.5. ↑ 37.0 37.1 37.2 Bones are White. Dark Øverlord Media, 2012, p.90. ↑ Alight. Del Rey, 2016, p. 251. ↑ Nitzans Shamdi (The Crypt). ↑ The Rookie. Dark Øverlord Media, 2009, p.73. ↑ 41.0 41.1 The Rookie. Dark Øverlord Media, 2009, p. 8. ↑ The Recruiter (The Crypt). ↑ Bones are White. Dark Øverlord Media, 2012, p.66. ↑ Captain Travis Ellis (The Crypt). ↑ 45.0 45.1 The Rookie. Dark Øverlord Media, 2009, p. 107. ↑ Pippa Remic (The Crypt). This page was last modified on 6 February 2019, at 16:52. This page has been accessed 30,017 times.